Title-winning captain Adam Murray is the latest name to join the panel for the supporters-led Q&A night ‘Legends Live’ in the Sandy Pate Sports Bar on Friday, 27th July (8pm). Murray first joined the Stags initially on loan from Derby County in 2002 as a youngster and returned twice as a player in separate spells, before making the transition into management following the departure of Paul Cox, to whom Murray was player-assistant as well as club captain. The popular midfielder never hid his passion and love for the club, on and off the pitch, and often played through the pain barrier during his third spell with the Stags – during which he led the club out at Wembley Stadium in 2011 in the FA Trophy Final, reached the Conference play-off semi-finals and then lifted the Conference title – his face streaming with tears of raw joy. Murray joins former striker Richie Barker on the panel of legends, answering questions and recalling memories - all in the name of charity as the evening, hosted by Mansfield Matters, will act as a fundraiser for the Alzheimer’s Society. The evening will also include quizzes, stage entertainment and a prize raffle with funds raised going to the charity. 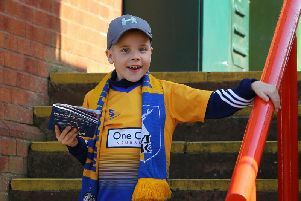 It will be hosted by Mansfield Matters’ Craig Priest, who said: “I’m delighted that Adam has agreed to participate in the event. “I have real respect for him as a person and I’m really looking forward to hearing his stories as, publicly, this will be the first time Adam will have spoken too and mixed with supporters since his spell as manager. The supporters-led charity night is free for people to enter with donations encouraged on the door. Along with Barker and Murray, other players who have participated in episodes of the ‘A Trip Down Memory Lane’ Series have also been invited. More names will be announced in due course.